Just Jingle: It's DIEcember Time! Yup! It's that time of year, again! It's DieCember time at Simon Says Stamp! That means an entire release of awesome new dies! WOOT! Heidi was kind enough to send me the new Stitched Dress Up Tags to play with for the release! Ummm.... I absolutely LOVE THEM! These are officially new staples in my die stash. They are fantastic! 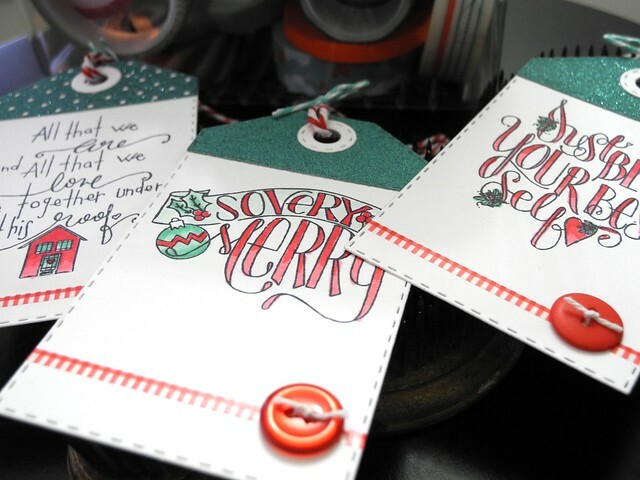 I created three tags using the new dies, bringing in the So Very Merry stamp set to use with them. I cut the tag toppers with glitter paper to add some sparkle to the design! I colored the images, minimally, with Spectrum Noir markers for a bit of color. 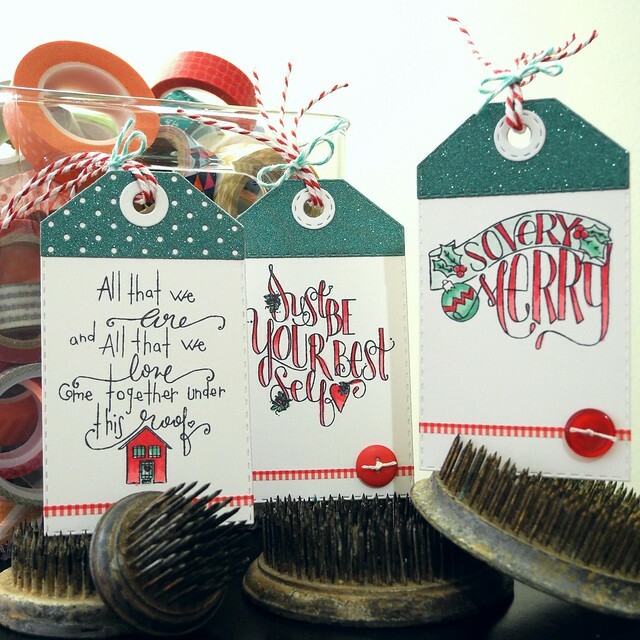 Be sure to stop by the Simon Says Stamp blog to find more inspiration using this awesome new release! Ready to shop? You can check out the DieCember release along with lots of other awesome stuff over at Simon Says Stamp! So beautiful! Love those tags! Fun tags! Very festive for the holiday season. Oh wow, you've really used Tammy's stamps well! Gorgeous tags and coloring! Such cute tags! The sparkly toppers are really pretty! Love that you picked something different. Loving to see the tags in action!! love these!! kicking myself I didn't order this set DOH! Wonderful tags and very festive! Wow! Cute and festive tags. These are beautiful tags. I love the choice of colors. Very nice tags, thanks for the inspiration. Great tags! Love the clean and simple coloring! Amazing, adorable tags! Love the sparkly tops! Love your tags! The layout, the colouring, all the design elements fit together so well! Love that this die allows you to cut several way and lets you add more color and texture. Your tags are so cute!!! Love these tags. Great coloring. Adorable, festive tags! Love the lettering! Great tags! I love the teal and red. Amazing tags and love colors!!!!! Fantastic job on the tags. Makes me want to make a few !! Great colour choices Jingle! Super tag dies with so many possible options. Awesome tags. Design and color....beautiful and perfect. Love these tags and the sentiments. Such positive words on encouragement on your tags! So meaningful! Beautiful tags! Love that new die also! Beautiful tags - really love the shade of green you used at the tops. Awesome tags!! Love these dies!! Love your tags...and am so ready to shop!! Almost everything is out of stock already....just makes me crazy!! FANTASTIC stitched tags, they all are dressed up! Merry Merry! I love tags and these are awesome! I have to pin these. TFS! Lovely stamp set and your coloring against the white looks terrific. beautiful tags! Love those sentiments. I love your tags that is so much the die I want out of all of them. Good job. Thanks for sharing. LOVE your super cute tags with the glittery tops! Lovely tags. I just love that tag die set. So sweet. Gorgeous tags! These are gifts in and of themselves. Awesome fun tags and that tagdie is a must have. Very festive & cute tags! I like your fun and festive tags. Love the new dies and your tags are adorable! Oooh your tags are fabulous! How fun...they look so whimsical. Adorable!! They're so fun and whimsical! Awesome tags! I love the "touch" of red! Beautiful set of tags in awesome colors! Love them all! Sweet sentiments! Love your tags. They are simple enough to make a lot, and still have that wow factor. I'm off to create. Thanks again for the great inspiration. See you over at the SSS challenge. Love the colours in your tags. Great tags! I love those sentiments and the sparkle. Your tags are lovely. Thanks for sharing with us. A great set of tags. Is that strip across the bottom machine stitched, or is it faux? Love your tags and these new dies! Beautiful tags. Love the vibrancy of color. Gorgeous tags. Love them all.